Yep. It’s release day again. I think I need to slow down since I seem to be saturating the market with stories. I keep hoping the next one will be the one to hit it big but so far, nada. Anyway, I love this story. 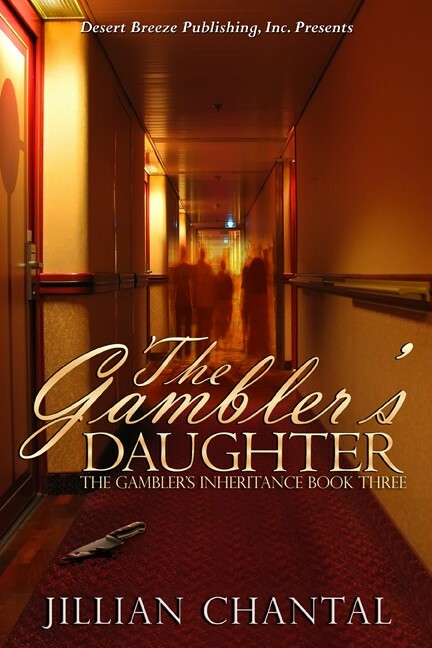 It’s the third in the series of The Gambler’s Inheritance and is called The Gambler’s Daughter. It has a paranormal element, too. Even though each book in the series is a stand alone murder mystery, some of the same folks show up in them all. I love to visit with my old characters and hope the readers do as well. Here’s the buy link, the excerpt and the blurb- not necessarily in that order! “I sure can.” She let go of Michel’s hand and stood. “Come on, then, we have a vessel to inspect. That cover is amazing. It definitely shows a paranormal element with the shadows in the hall. Interesting that there are 3 shadows…and three books with 3 primary characters.Hmmm. I love mystery’s and boats, whoops ships. The excerpt is an attention getter, wishing you much success with the release. Yep, ships. Lol. Thanks for the good wishes. Glad you liked the excerpt.